The Hakkasan Group has done it once again! Wet Republic is one of the biggest and best pool parties in Las Vegas! There is no denying that the MGM has the best clubs whether is night or day or wet or dry! The Wet Republic pool party in Las Vegas is an astonishing 54,000 sq.ft. venue that consists of a intimate dipping pools, daybeds, banquets, tricked-out Bungalows, Party Cabanas, and a massive saltwater pool! You will also get to enjoy unique culinary offerings, signature cocktails, premium bottle and pitcher service in the lounge or ordered poolside. 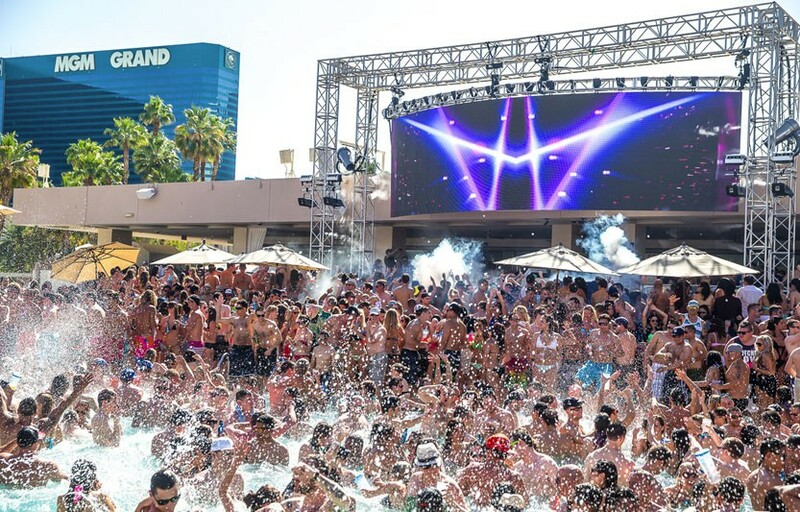 Wet Republic’s pool party is unlike any other day club in Sin City! Upon entry into the massive day club you will be able go to the pool or head over the the long bar! The long bar area provides you with frozen drinks to keep you cool and refreshed in the Vegas heat. Here at Las Vegas Guest List, we suggest getting the cabanas or VIP bungalow! When you choose to reserve one of the cabanas you will also get pitcher service of mojitos or other summer drinks. The cabanas aren’t your typical poolside rest spots! Hakkasan knows how to treat their guests with a certain type of glamour that includes giant TVs and Blu-ray players. The bungalows are on a completely different level and are considered beyond luxury with guarded access, plush furniture, TVs, misting fans, private plunge pools shared by the bungalows and separate restroom and shower facilities just for your bungalow. We must admit the thing that really sets Wet Republic apart from the other day clubs in Sin City is the amount of top notch performers booked every weekend. As a sister property to the nearby Hakkasan Nightclub, artists like Tiësto, Steve Aoki, Calvin Harris, Krewella can be seen at Wet Republic on a regular basis. Between the uncomparable sound system and LED setup over the DJ booth, you might never want to leave the paradies in the desert. Hakkasan is really outdoing themselves with a lineup including Calvin Harris, Tiësto, Hardwell, and Steve Aoki as well as Afrojack, Above & Beyond, The Chainsmokers, Fergie (DJ), Martin Garrix, Dada Life, Sunnery James & Ryan Marciano, The Bingo Players, Eva Shaw and W&W. When you go to Wet Republic pool party in Las Vegas, don’t relax too much, you wouldn’t want to miss out on all the once in a lifetime events happening here! Wet Republic dayclub is the unrivaled venue that has transformed the Las Vegas pool party scene. It is the must-see, must-experience pool destination. Check out our Events Calendar and see what’s happening at Wet Republic Pool Party Las Vegas and view the Dress Code!